SMS 3G/2G, BBC MicroBit and more. 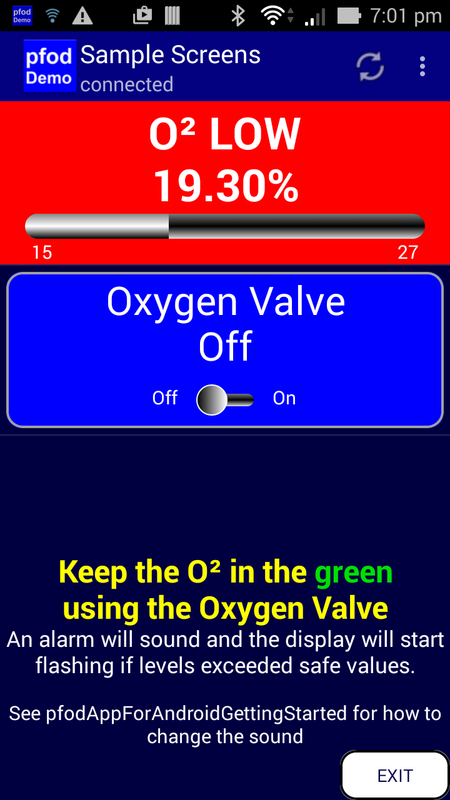 The latest version of the free (and add free) pfodDesignerV3 Android application lets you design your own system of Android menus to turn Arduino outputs on and off and then generate all the Arduino code necessary to display those menus and control the outputs when you connect using pfodApp via bluetooth, ethernet, wifi or SMS. No Android Programming is required and No Arduino Programming is required. As you design your menu you can see a preview of it exactly as it will be displayed by pfodApp. The top left screen shot is a preview. You can add menu items and change the text size, colour and style. As well as setting the background color and specifying which output you want to control. When you come to generate the code you can specify which serial connection to use and the baud rate to match your Arduino board and bluetooth or wifi hardware. As well as output on/off toggle buttons you can also design plain menu buttons. For these plain buttons the generated Arduino code will display the menu on pfodApp on your mobile and parse there return when the user clicks the button. You only have to add the action code to do what you want. 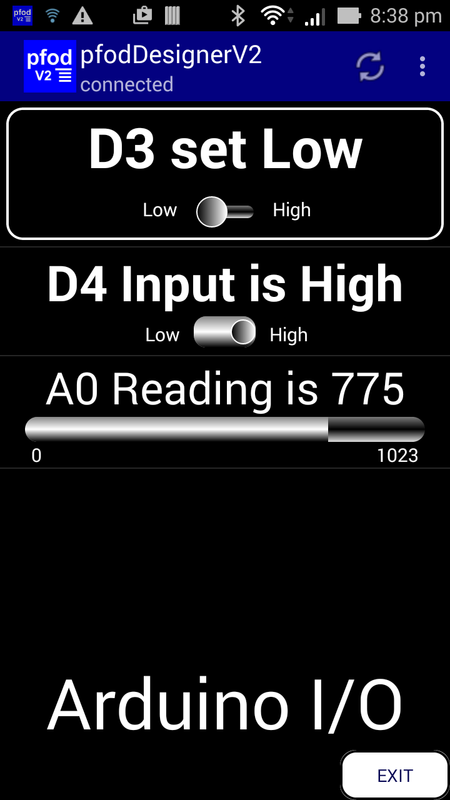 How to Display Arduino Data on Android for Beginners – Absolutely NO programming required. This tutorial generates ALL the Arduino code necessary show and Arduino data and also control outputs. 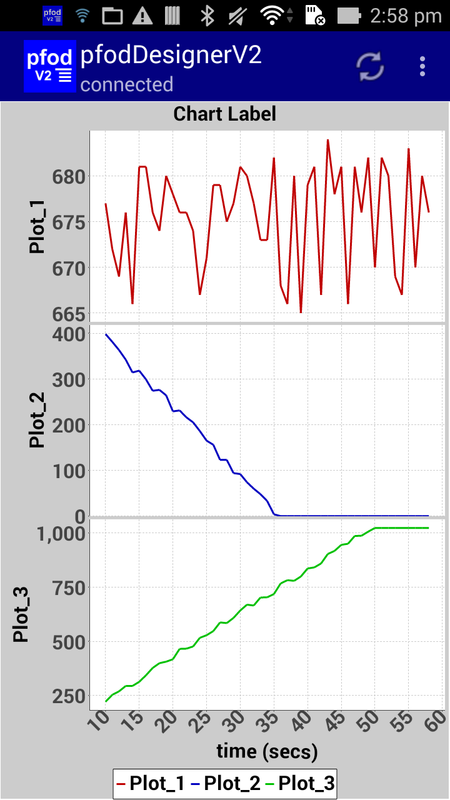 This tutorial shows you how to use the pfodDesignerV2 and pfodApp to create custom menus to plot and log Analog reading, display Analog readings and the state of a Digital inputs and control PWM outputs and set/pulse Digital Outputs. All the Arduino code is generated for you by pfodDesignerV2. pfodApp connects to your Arduino and displays the menu and lets you interact with your Arduino. The Arduino 101 board is used as an example but many other boards are supported. Design a Custom menu to turn the Arduino Led on and off – Absolutely NO programming required. This tutorial generates ALL the Arduino code necessary turn the Arduino's LED on and off from your Android Mobile. It is used as the basis for the Bluetooth Low Energy tutorial. Android/Arduino Menu Designer for Beginners to switch things on and off from your mobile – Absolutely NO programming required. 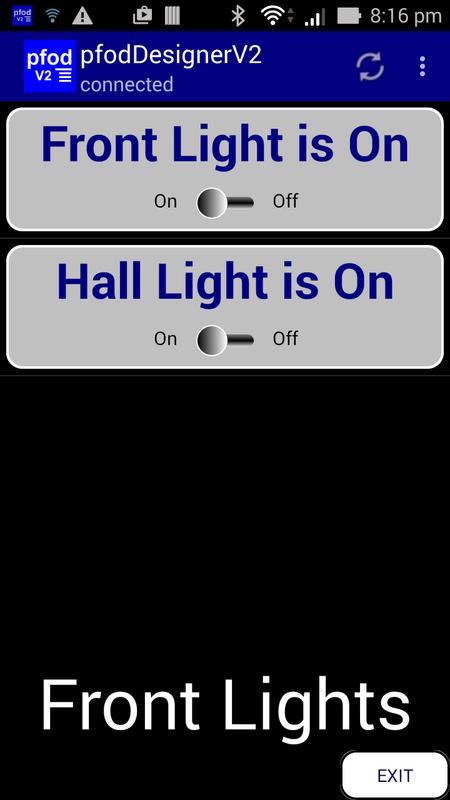 This tutorial generates ALL the Arduino code necessary to display custom on/off toggle buttons on your mobile and switch relays on and off as you click the buttons. 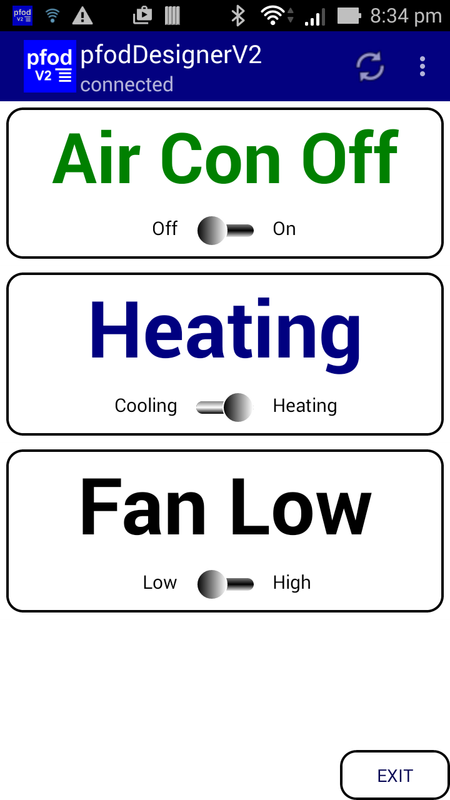 Android/Arduino menus for Beginners – Design Custom menus to switch Arduino outputs on and off – Absolutely NO programming required. This tutorial follows on from the previous one and shows you how to make your own menu system with sub-menus using pfodDesignerV2 to design the menus and their contents and then generate the code to show the menus on your Android mobile. How to pulse an Arduino output from a button on your Android mobile – No Android programming required. 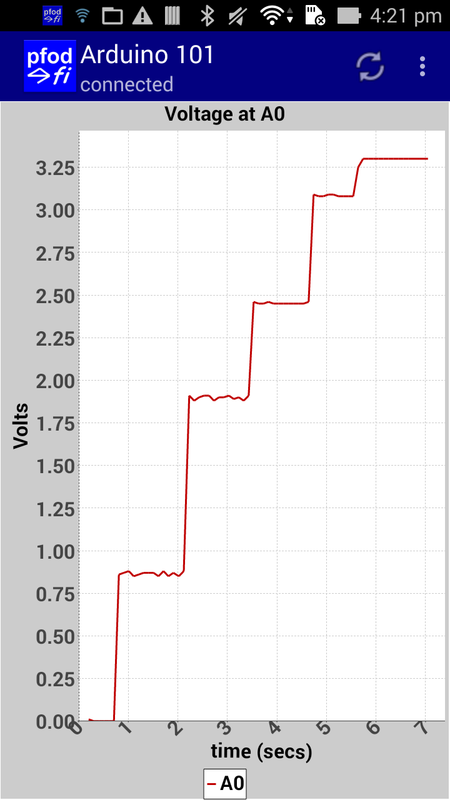 How to use pfodDesignerV2 to make an Arduino output pulse from our Android mobile. 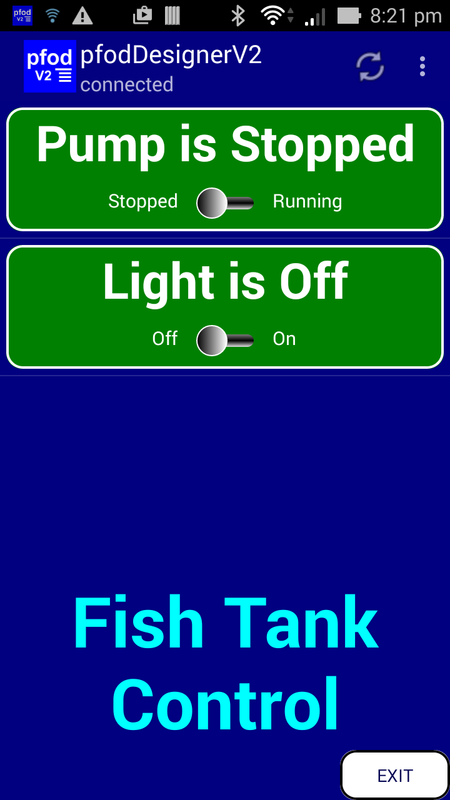 For example to use for a Garage Door control or to turn off Fish Tank pump while feeding. Android / Arduino menu buttons – A little Arduino is programming required. No Android programming required. This tutorial generates Arduino code to display your custom menu buttons on your mobile and parse the commands sent when you click those buttons. You only need to add some action code to the sketch to do what ever you what to do when the button is pressed. Making Loud and Flashy menu buttons – How to make pfodApp play a sound and flash the menu item. Also covers ignoring user input for some menu items that are display only. Auto refresh and adding a Blank Space to pfodApp menu – Designs an example menu for Inline ESP8266 controlled power switch which auto refreshes the menu ones a second and addes a blank spacer to move the on/off menu button to the centre of the screen. Although the pfodDesignerV3 is free, when you have finished your design, you will need to purchase pfodApp to control your Arduino, via bluetooth or wifi or SMS, using your custom menu.